Copy this to your clipboard with CTRL+C on Windows or CMD+C on Mac. On mobile tap to select and copy to your clipboard for sharing. The battle between Donald Trump and Jorge Ramos could hurt the billionaire businessman. Rep. Ted Lieu, who represents Los Angeles , has a message for Jeb Bush over his "anchor babies" comment. Scott Walker on the stump in Iowa. Hillary Rodham Clinton unveils a plan to help rural communities. Clinton calls for more gun control following a high-profile shooting of television reporters. If anything, we should be taking them to the woodshed. Wisconsin Gov. Scott Walker, in Iowa on Wednesday talking about China. He said President Obama should cancel next month's state dinner that will host Chinese President Xi Jinping. Hillary Rodham Clinton used the high-profile shooting deaths of two Virginia television reporters on Wednesday to call for stricter gun-control measures, vowing that as president she would “do something” about gun violence. Speaking to reporters in Iowa, Clinton said lawmakers must figure out how to balance 2nd Amendment rights with “preventive measures and control measures” that will halt gun violence that plagues the country. Though the issue of gun control has repeatedly come to the forefront of political discussions after high-profile mass shootings, it has led to no federal reforms. In the wake of the December 2012 shooting of 20 children and six adults at Sandy Hook Elementary School in Newtown, Conn., President Obama called on Congress to mandate universal background checks for buyers of guns. That effort faltered in Congress, though several states, such as Connecticut and Colorado -- site of the 2012 mass shooting at a movie theater -- passed stricter reforms that include background checks and limits on ammunition magazines. Several national surveys have shown widespread public support for universal background checks. Shortly after the racially charged massacre of nine black worshipers at a Charleston, S.C., church in June, Clinton called for stricter reforms, while some Republicans balked. Days after the church shooting, Republican candidate Jeb Bush said that no mass shooting “would have been stopped with any of the ideas proposed by Barack Obama. Not a single one of them." On Wednesday, after the Virginia shootings, Clinton was the most outspoken of the 2016 presidential hopefuls in calling for gun control. Many Republicans offered condolences but did not wade into the debate. One Democratic senator has an easy answer to Hillary Rodham Clinton's struggles, the surging interest in Bernie Sanders' presidential candidacy and Vice President Joe Biden's potential bid: that messy Republican primary. Retiring California Sen. Barbara Boxer, downplaying Democratic tensions, told reporters Wednesday that the GOP is rife with problems. Boxer, a Clinton supporter, said Republicans "don't have a unified message." "When you listen to Trump TV, which is most of TV these days, what you hear is Republicans going after each other with the most fierce animosity I've ever seen," Boxer said in a conference call organized by Clinton's campaign. Boxer also said that Clinton and Sanders care about the same issues, including income inequality, student loans, women's rights and voting rights. "Hillary's approach is to bring people along; Bernie's approach is to kind of pound the table," she said of her Senate colleague. "That's Bernie." As for Biden, expected to make a decision at the end of the summer on whether to seek the White House a third time, Boxer said she thinks he is "wonderful." "This is his decision," she said. "If he wants to run, I think he should." Jorge Ramos has long been an influential figure to Latinos in the United States. Known for asking politicians tough questions, Ramos and Republican presidential front-runner Donald Trump engaged in a heated battle in Dubuque, Iowa, on Tuesday. Here's some more information on the Univision anchor. In the hours after two television reporters were killed in Virginia, White House hopefuls used social media to offer condolences. With high-profile shootings, at times the political discussion can turn to a debate over gun control. Here's what some candidates were saying on Wednesday. Former Florida Gov. Jeb Bush has received lots of criticism for linking Asian Americans to the term “anchor babies.” But one of the most personal of those critiques came Wednesday from Rep. Ted Lieu, above, a Los Angeles Democrat whose parents brought him to the United States from Taiwan when he was 3. Bush stumbled into the controversy Monday. Facing heat from Latinos for using the term “anchor babies” to describe children born in the U.S. to undocumented immigrants, Bush said his comments were actually directed at Asians. “What I was talking about was the specific case of fraud being committed, where there's organized efforts -- frankly, it's more related to Asian people coming into our country, having children in that organized efforts, taking advantage of a noble concept, which is birthright citizenship,” he said. That could hurt Bush as he seeks the presidency. Asian Americans are one of the growing minority groups that Republican officials have said they are working harder to court. The GOP “autopsy” report that followed the party's loss in the 2012 presidential election, written as a guidebook for the national party, said, “We need to campaign among Hispanic, black, Asian, and gay Americans and demonstrate we care about them, too.” The report said that President George W. Bush won 44% of the Asian American vote in 2004, while Mitt Romney received only 26% in 2012. “It is sad to think this all comes from the moderate Republican presidential candidate,” he added. Hillary Rodham Clinton will roll out her agenda for improving rural communities during a campaign swing through Iowa on Wednesday, and to nobody's surprise, support for the Renewable Fuels Standard is showcased within it. The program, which mandates that escalating amounts of biofuels be blended into the nation's fuel supply, is a crowd pleaser in Iowa, the source of much of the corn used to produce ethanol. But Clinton is leaving vague just how big a role she sees for corn in the future of the nation's energy mix. Producers are scrambling to move beyond it, amid concerns that corn-based ethanol is doing little to slow global warming -- and may actually be exacerbating it. The technology, though, has not kept pace with what lawmakers envisioned when they created the program eight years ago. By now, the nation's cars were supposed to be running on less corn and more agricultural waste, like husks, cobs and stalks -- as well as on more environmentally friendly crops like switchgrass. The Obama administration keeps postponing rules that would require the next generation of biofuels to be used, much to the dismay of innovators and environmentalists. The Environmental Protection Agency warns the products are still too costly and the supply too short. Clinton vows that as president she would “drive the development of advanced biofuels.” But environmental activists and biotech investors are looking for a more concrete commitment. They want the benchmarks in the existing mandate enforced. Univision and its highest profile journalist haven't been shy about acknowledging their approach to coverage of the 2016 campaign: The Spanish-language network views immigration as its top issue and isn't afraid to cross over into advocacy journalism. The Republican Party has been complaining lately about how some Latino journalists, including me, only ask them about immigration. That is correct, but what Republicans don't understand is that for us, the immigration issue is the most pressing symbolically and emotionally, and the stance a politician takes on this defines whether he is with us or against us. We've reported on the worries in Republican circles that Donald Trump's candidacy will tarnish the whole GOP brand, particularly with Latinos. But a new Gallup analysis shows, at least for now, that doesn't appear to be happening. 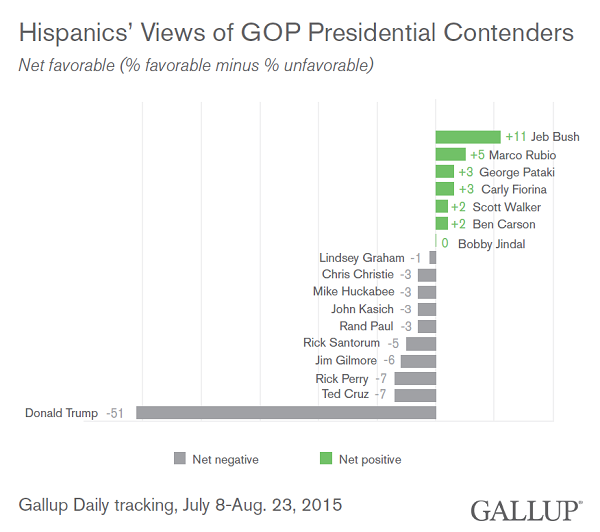 Gallup notes that the results don't mean that Trump's anti-immigration rhetoric has no impact on his GOP rivals. In fact, the tracking surveys picked up a notable upward swing in the Jeb Bush's favorability from July to August, as Trump's heated rhetoric reached full boil. Bush's net favorability went from a +1 to +22 in that period. It's possible, the pollster noted, that Bush, as a GOP moderate on immigration, benefited from being a visible counterpoint to Trump. These surveys, however, were done largely before Bush seemed to shift and joined with Trump on the use of the phrase "anchor baby" and the discussion of birthright citizenship. So while Republican may not have suffered much from "guilt by association" in the eyes of Latino voters this summer, "guilt by participation" is another question. Can Donald Trump take on the media and win? Donald Trump battled publicly with two powerful media figures Wednesday -- Fox News' Roger Ailes and Univision' s Jorge Ramos. If he were an ordinary politician, following ordinary rules, it would be hard to see the upshot for Trump in either fight. Ailes is a gateway to the news organization most trusted by the voters Trump will need to win the GOP nomination. Ramos is the most influential broadcaster in a community Trump should have little interest in further antagonizing. He's not going to win a majority of Latino voters, but if he actually wants to be president, he needs to make some inroads. But typical political analysis seems not to apply to Trump. If one focus group of fans is any indication, Trump supporters are deeply distrustful of the media and they like Trump precisely because he says what others won't (perhaps knowing they shouldn't). There's very little that seems to truly turn them off. When it's Trump against the world, Trump wins in their eyes. Meanwhile, Trump seems to firmly believe that all publicity is good publicity. Few entertainers understood better how to maximize the value of a celebrity-on-celebrity public brawl. “Controversy, in short, sells," he wrote in "The Art of the Deal."